Our workshops and display buses will be open to the public throughout the day. We will also have a number of our heritage buses transporting the public between the various museums at Whiteman Park at this very popular family event. 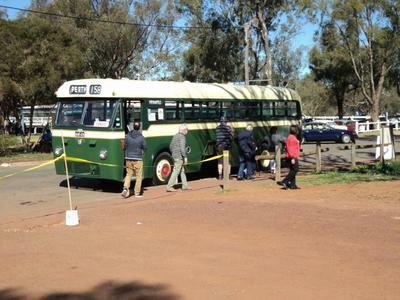 Come along and enjoy the day and ride on a bus from yesteryear. 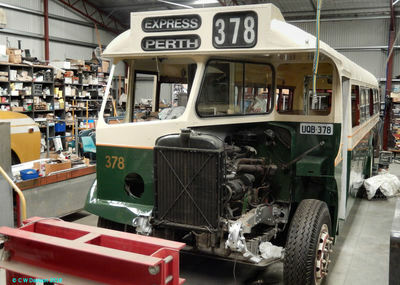 See how we restore these heritage buses from the ground up to tell the story of Perth's rich transport history. BPSWA member Buffy Davies (Bride-to-Be) recently gathered with her family and friends for her hens party. With Colin Davison at the wheel, the bride-to-be and her party of "hens" were transported in style in our heritage 1951 Guy Arab 101. This popular members-only event was a huge success commemorating 60 years of MTT, BBQ and an end-of-year report on a very industrious year at BPSWA. 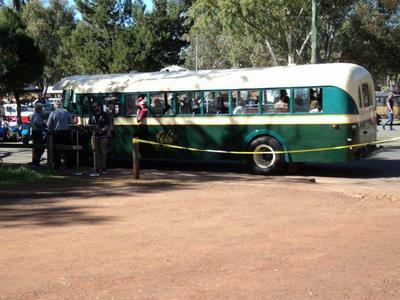 Members, family and friends enjoyed a beautiful evening with a bus ride around Whiteman Park and a relaxed BBQ. Our Host Pat Hallahan paid tribute to the 60 years of MTT and the former MTT employees, some of whom are now members of our Society. Our lineup of buses on the workshop forecourt depicted five former MTT buses in our collection and three pre-MTT buses. Alan Mortimer, a long-serving member of BPSWA was awarded a Lifetime Honorary Membership. Alan has been an active member for over 45 years, contributing in many roles as Councillor, Secretary, Vice President and President as well as photographer and Editor of Rattler. On the cusp of reaching 80, Alan remains active for BPSWA both as a Councillor and as a regular driver on the Whiteman Park Shuttle Service. 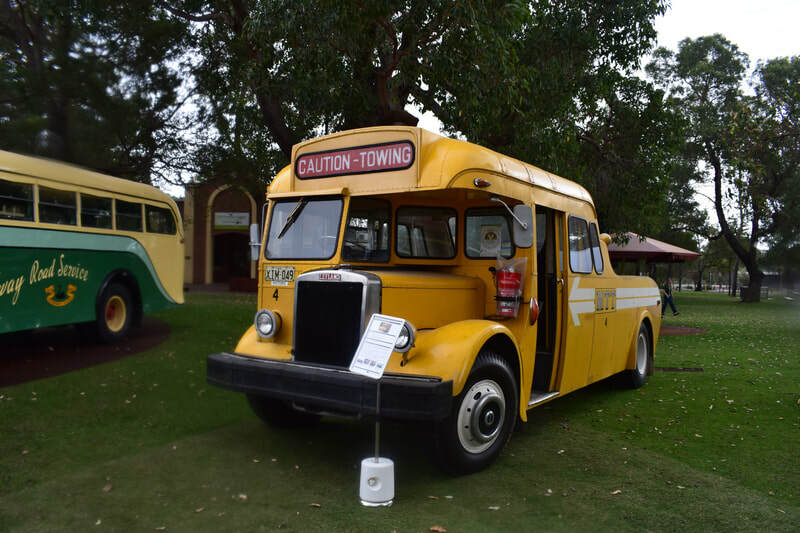 2018 Canning Show "Make Smoking History"
A number of our restored heritage buses were on display at this family-friendly event in Cannington. Our display in the Community Courtyard on Friday night and Saturday had buses ranging from a 1949 Leyland Tiger to a 1962 Leyland Worldmaster, complete with heritage prams on the back. 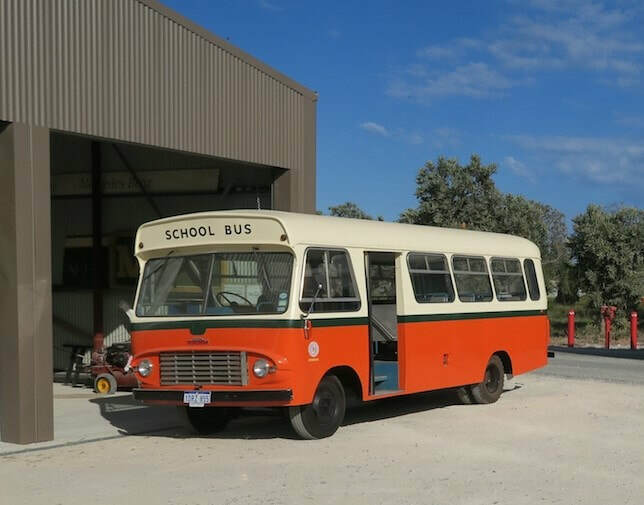 BPSWA participated in this popular event hosted by Rail Heritage WA at Railway Museum in Bassendean where we display buses from our collection that had an intrinsic link to WA railway services of the past. For the duration of a weekend conference held in September, BPSWA supported the Perth Electric Tramway Society in providing a true transport heritage experience for delegates attending this conference. Delegates from around Australia and Asia travelled on eight of our different heritage buses to inspect museums and displays in and around Whiteman Park and Perth city. 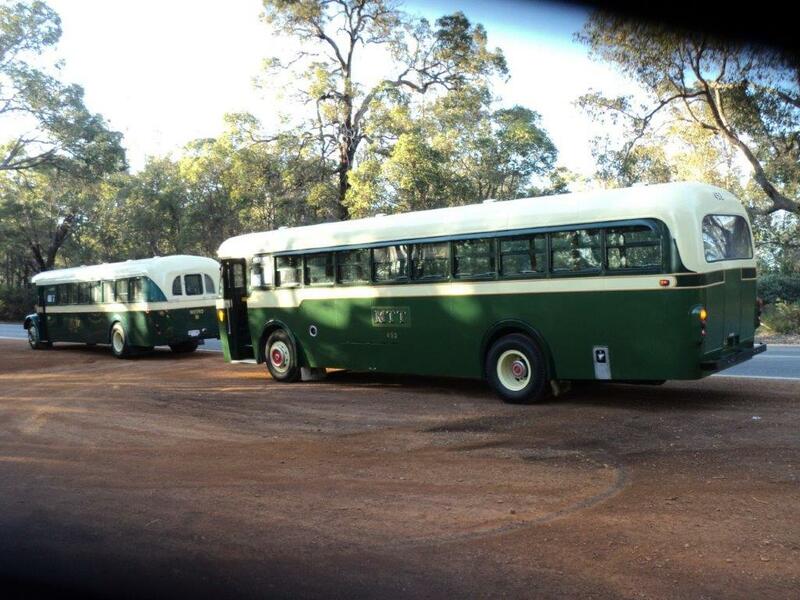 Our BPSWA heritage buses provided free bus transport between the Village Car Park to the Mussel Pool Train Station. Families always enjoy this popular event and take advantage of travelling between the railway stations on restored heritage buses. Our bright yellow Leyland OPS4 Tow Wagon was very popular with the visitors, like this young fellow who took the opportunity to sit behind the driver's wheel. It was also a great day out for our volunteer drivers Neil Munt and Ian Kerr. 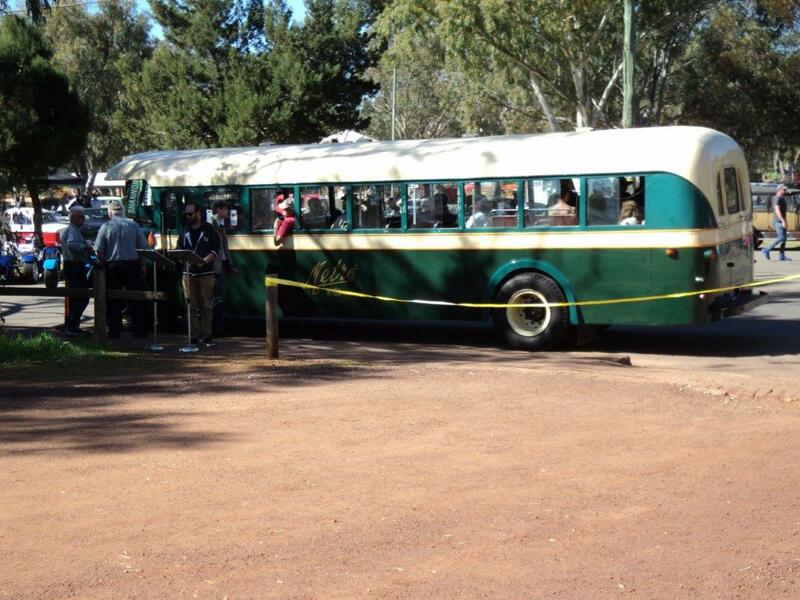 Conference attendees were treated to a ride in a heritage bus through Woodland Reserve and on to the Caversham Wildlife Park. BPSWA actively participated in the York Motor Show 2018 by providing bus tours around historic sites within the town of York. The heritage buses were well received by the public who showed considerable interest in our bright yellow Leyland OPS4 tow wagon. The fun commenced at 10:00am and continued until 3:00pm with BPSWA-provided heritage bus tours running every 15-30 minutes. Pictures by Bill Allnutt and Jake Dimovitis. The BPSWA Annual General Meeting kicked off with a bus parade around Whiteman Park. The weather stayed fine and some members took the opportunity to enjoy a ride around the park and the Village Station before returning to the depot for the meeting. President, Tom Curtis, gave an overview of the major achievements throughout the past year and Treasurer, Malcolm Crosbie, gave a full report on expenditure throughout the year and our current financial status. All council positions were declared vacant and nominations for the coming year were received and processed with the existing council members being re-elected. ​Daryl Clarke once again provided a wonderful afternoon tea for the members attending the AGM. Thank you Daryl! 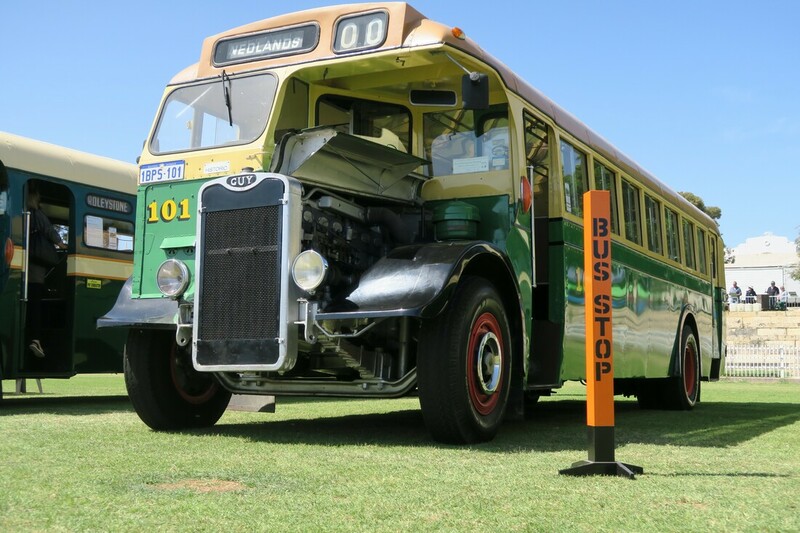 The Village at Whiteman Park was the place to be to see an amazing display of transport heritage vehicles that were used in and around the city of Perth. 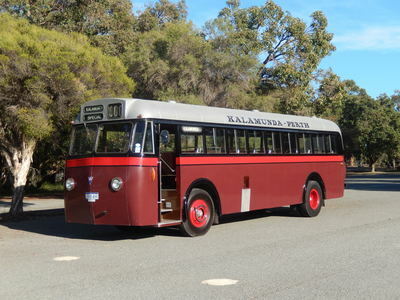 From trolley buses of the early 1900’s to the sleek buses of the modern era, there were examples of many decades of public transport vehicles for visitors to enjoy. Photos courtesy of Pauline Orr and Jake Dimovitis. The BPSWA team headed down to the Woodloes homestead in the heart of the City of Canning with two of our Leyland Royal Tiger Worldmaster buses #452 and #591 to commence heritage tours at 11am. The Woodloes homestead built on the banks of the Canning River in 1871, is one of the earliest homes in the Swan River Colony. The modern-day roundabouts and speed humps posed some challenges for the 1960's buses equipped with "armstrong" steering and gear changes. 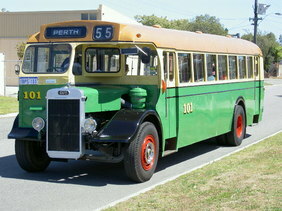 The internal lights and the pull cord bell-ringing were popular features of the buses that were enjoyed by the passengers on their Historic Tours of Canning. Thank you to our drivers, Neil Munt and Ray McNaughton who won the day with appreciation and donations from the travelling public. Report and photos by Jake Dimovitis, BPSWA Event Co-ordinator. There was thunder, there was lightning, there was rain! Members of the public braved the dramatic autumn weather to visit our workshop at Whiteman Park to view our heritage bus collection. The younger enthusiasts were particularly impressed with the model collection in the display cabinets and the recently donated Alan Moon collection. 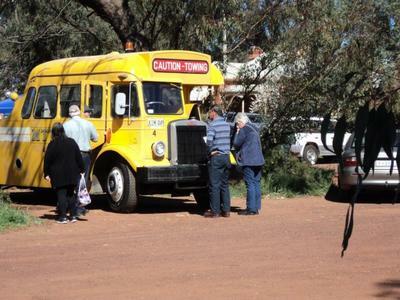 There were opportunities for enthusiasts of all ages to get behind the wheel of a half-cab bus, clamber over the OPS4 tow truck or inspect restoration works in progress. Despite the challenging weather the displays were well received by the public who dodged the rain showers between the BPSWA and Bennett Brook Railway workshops. Many thanks to our volunteers who supported the Heritage Month Open Day as drivers, conductors, guides, mechanics and general hands.